Forgive me because I feel this post is going to be random and all over the place! How about that Super Bowl? Was anyone disappointed by the outcome? I have to admit I really didn't care who won. I pretty much watch the Super Bowl for the commercials, and half time show, anyone else like me? This was my favorite commercial of the evening! And thank goodness Madonna sounded better then last years Black Eyed Peas Performance! We sat around eating delicious homemade pizza, guacamole delicious, Trader Joe's dessert and some yummy salad! (My pizza was loaded with spinach, basil, and cilantro, and of course we had pepperoni for my dad)! This week is a short one for me, since I leave for Columbus on Thursday! So this weeks Pinterest Challenges is going to be short, but don't worry still delicious! I did finish off last weeks Pinterest challenges this weekend with the final two dishes! And both were delicious, and in my mind keepers. Lets start with this soup. Tasted like a grown up version chicken noodle soup. I loved the addition of spinach, and the orzo made this broth base soup seem thick and filling! This recipe makes a big pot of soup. Would be perfect to make on Sunday nights then you would have delicious soup to eat the entire week! So good! I loved that there was a subtle balsamic flavor, and that the salad was not dripping in dressing. I topped my serving with a bit of feta, which was a great flavor punch! Easy to assemble, and keeps well. 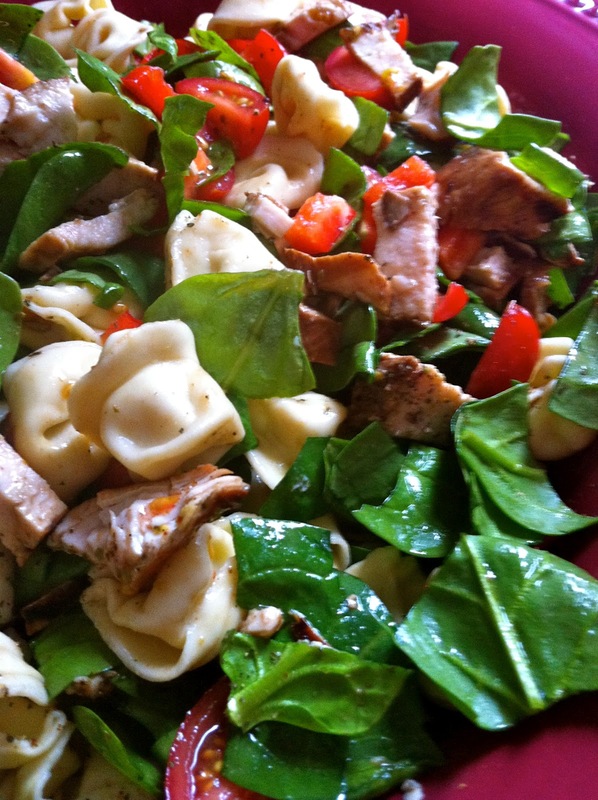 This salad will be making its way into my lunch box this short work week! 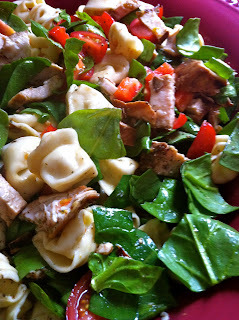 Lets wrap up this post with the two recipes in this weeks Pinterest Challenge. I found this gem of a recipe, and immediately decided I had to make them this week! I love stuffed peppers! And I have not made them in what seems like forever! Hoping these ones will have a great flavor, and judging by the spices called for I think they will be delicious! I am hoping this will taste like a healthy version of my favorite fried rice from PF Changs! This week I am also trying to lighten up on of my moms favorite breads recipes, stay tuned for the results! PS: Anyone score some Jason Wu pieces this weekend at Target? I did't venture out Saturday to check out the collection, but I am going to go see if out local Target has pieces left! Such a great collection, full of classic pieces! Thank you for posting the M&M commercial. That was the only one I missed! That's so nice that you have a short week! enjoy your short week, lucky you!! And i missed the M&Ms commercial, i loved all the dog commercials they were hilarious! I LOVED the halftime show! I love Madonna! You are so good for trying the Pinterest recipes! I need to get on that asap! I'm not really into Super Bowl either, but I was rooting for the Giants (NY BABY)!!! I watched the commercials too, and yes Madonna was awesome. I didn't like her new song, but I loved Vogue and Like a Prayer. She sounded amazing!!! You're making me hungry with this post! Your superbowl snacks and food look delicious, and that vegetarian fried rice looks amazing! YUM! Glad you had a good weekend. And thanks for the sweet comments on my blog today! totally bummed to miss Jason Wu, but great Sunday Funday recap! haha that commercial is hilarious! I love it! Thanks so much for posting it. I ended up chatting in the kitchen the whole night and actually not catching any of the commercials, so loved seeing it. That commercial was too cute--everyone has been talking about it, but I missed it! 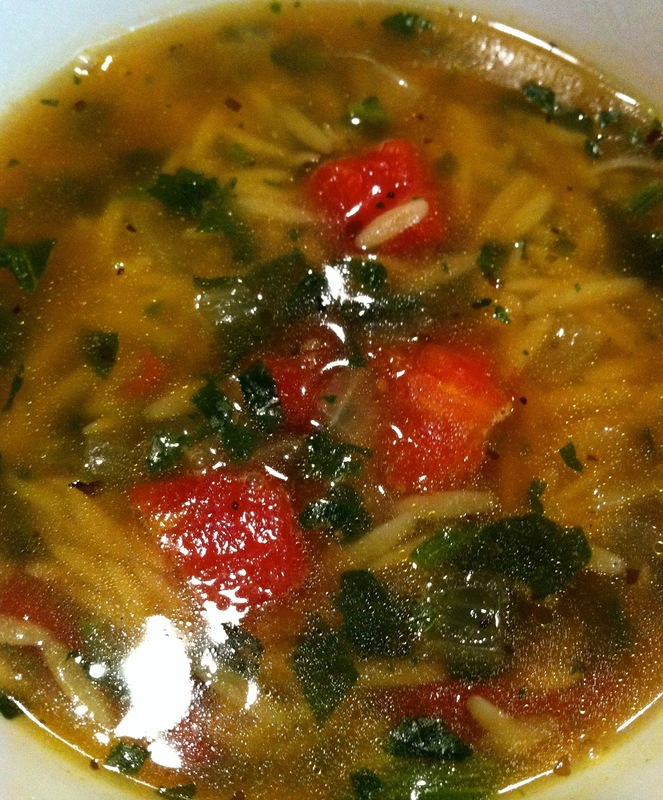 And mmm..that orzo soup sounds delish--I love soups and really want to learn how to make some! i looooved madonna... she rocked it and everyone wishes they looke like that at any age... haha!!! all these food looks so good!!! Totally with you...just the commercials! Goodness you had some delicious looking eats at your Superbowl party! I am so jealous! :) That pizza looks amazing!! I am planning on trying to make a trip over to Target as well. I sure hope they have some great pieces left, they look amazing!